With the tremendous growth Nashville is experiencing, the city provides an apt environment for addressing and solving the issues affecting a rapidly changing city. 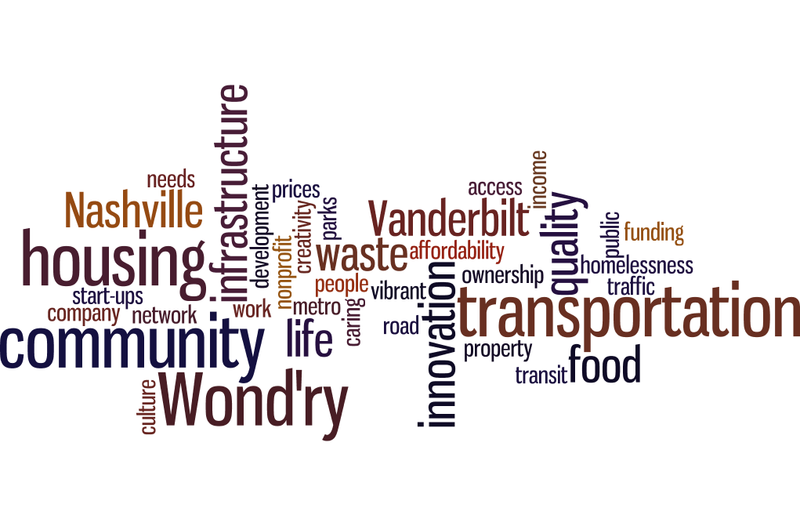 Partnering with the city of Nashville and local non-profits, the Wond’ry is developing pilot projects focused on solving urban issues like affordable housing, growing urban manufacturing and making opportunities, as well as transportation and health, which if successful can be adopted into full scale programs. Through our Social Innovations Program, the Wond’ry provides undergraduate, graduate and professional students with a collaborative environment that challenges them to incorporate their academic knowledge to solve real-world social problems. Students will work in interdisciplinary teams on a particular issue that they are passionate about and aligns with an area of strength for Vanderbilt. Guided by a faculty mentor, this student team will work on their project moving from early stage analysis to implementation. This program will build on Vanderbilt’s culture of service and exploration, ultimately championing student-led innovations that drives positive change in the local community and beyond. Currently the Wond’ry is focusing on the issues surrounding affordable housing, including issues surrounding wage disparity and the creation of jobs, through the urban manufacturing and maker movement. The Wond’ry has joined Nashville’s Social Entrepreneurs Alliance (SEA) and we have 5 student membership spaces available. Interested in one of the memberships?